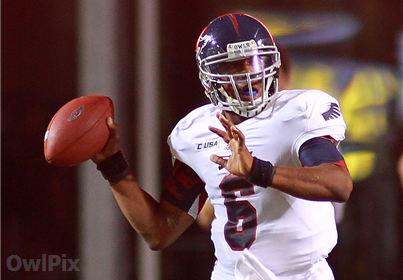 FAU offensive coordinator Brian Wright has always seen something in Greg Hankerson. The true freshman quarterback, who started the season rotating series with Jaquez Johnson, is expected to return to the offense this Saturday against Tulane after spending a lump of games on the sidelines. Wright believes that Hankerson can give the FAU offense something that they don’t see with Johnson and create a game planning concern for Tulane. Last week against Auburn Wright inserted Hankerson for the second offensive series by design, and that role could be expanded upon on Saturday. Wright isn’t certain when exactly Hankerson will take snaps, but it’s clear he wants the freshman on the field. Hankerson certainly has the better arm of the two quarterbacks and that became clear in his lone start of the season against Rice. While filling in for the injured Johnson, Hankerson threw for 272 yards and two touchdowns before a fourth quarter collapse resulted in a loss. While a series of plays late in that game exposed Hankerson’s youth, it shouldn't cover up his potential. Wright attested that Hankerson (pictured) has made developmental strides recently in practice, and that’s why he is pushing for playing time. Hankerson is one of just 17 true freshman quarterbacks this season to have started a game at the FBS level. Johnson tied a career-low with nine completions against Auburn, and wasn’t effective moving the ball against an SEC defense. Wright stated that Johnson will start against Tulane, but Hankerson could see extended action if he fares well in his series. “If I can feel comfortable throwing (Hankerson) in there in any situation and if he does that, I’ll pick one,” Wright said. Wright also mentioned that wide receiver Melvin German and defensive back DJ Juste have split reps in practice as the team’s third-string quarterback. - Noticeably absent from Tuesday’s practice was running back Jay Warren. Wright said Warren was limited because of “flu-like symptoms" which meant Tony Moore took snaps with the first and second team offense. - DJ Juste was at free safety on Tuesday and appears to have found a roll there after spending time at cornerback. - Freshmen defensive backs Ronnie Scott and Tyler Henderson both worked with the first team offense, and could be in position to have their redshirts pulled because of depth concerns. I get that Greg is a solid QB but I'm not sure I like bringing back QB rotations considering every game left is a must win. Just seems like Wright is rockin the boat. I think it is strategic in nature. Not likely he is going to play a half, or even a quarter….unless Johnson melts down. Probably just to mix it up and force them to add more to the prep list. Who knows with all this but Pelini and the staff are a bunch of clowns anyways have not figured out a QB's in two years now. Why would I expect anything from them. I really don't like the idea of bringing in the QB rotation game again. Our offense is not nearly complex enough to warrant 2 qb's playing. To me it looks like the coaches are saying "There's no way we are winning 4 games in a row to be bowl eligible so lets try some different things for next year." With that said, Hankerson definitely has the better arm. Hankerson has the better arm, but Johnson has proven that he can get the offense going and be very productive. I don't see the reason for trying to mix things up. Hankerson is not ready for DI ball, he cant read a defense and he's too small to take hits. Give him a year to develop…playing him Saturday is a bad idea. I wonder if this will change now with the coaching change……………………Jeeez we can't catch a break.